Sometime a travel product is so good it should be mentioned on a travel site. I admit I have bad feet. 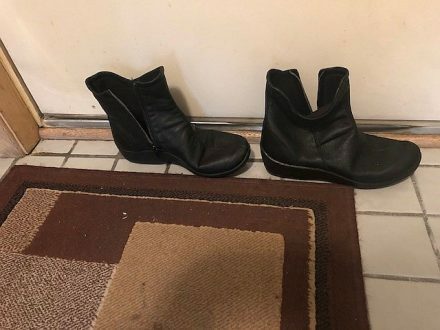 My high arch, wide foot, poor balance, bunions and hammer toes make it hard for me to find comfortable shoes and even boots. But upon a recommendation I tried a pair of Arcopedico stlye L19 in black. Oh my. I’m not sure what is in the arch but I feel these shoe-boots were made with me in mind. When I told a friend I was going to wear them downtown Chicago to cover an event, she said I was nuts to try something that I would not be able to change if it didn’t work out because I was an hour train ride from home. Not only did they work just fine but for once I could forget what I had on my feet. After checking on the product I found out that they are machine-washable even though they are water resistant. I also learned that this style is made of Lytech, a blend of Lycra and Polyurethane, that is a bio-degradable, vegan material unique to Arcopedico. That info is fine but as someone who is always traveling I like that they are lightweight and pack well. When I first tried them on I thought they looked too small, particularly with my wide foot. Maybe they expand but they fit fine. So I checked out the Arcopedico ® brand further. It features a Techno-Elastic upper section, an anatomic foot bed and a twin arch support system. Wow. When I took a cruise to South America last spring, I went to a lecture in the spa about foot problems. The expert handed me a pair of arch supports to try which I liked a lot but lost on the plane home. These shoe-boots seem to have a similar arch support so now I have to look for more Arcopedico footwear. Gues that shouldn’t be too hard because I learned they have been around since a Professor Elio Parodi created them back in 1966. I will look for them next time in a store’s shoe department but I also found them on Zappos and Shoes. A back road drive in Door County. The itch to getaway to a colorful scenic vista is upon us. The weather is showing signs of fall with warm days and cool nights and some trees in the neighborhood are beginning to show tinges of gold and orange. But before you throw a suitcase in the car and drive off there are a few tips that could up the fall color experience. 1.Don’t use your neighborhood color changes as the definitive guide. 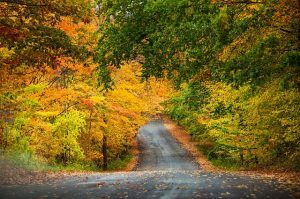 Colors in states or area of your state to the north and west may be in full fall color palette or just beginning to change south or east. In the US check fall foliage map or weather map for where the foliage is turning. Some states have color reports. Among the best in the Midwest is Wisconsin. 2.Make accommodation reservations ahead of time. You’re not alone when looking for a fall destination but to avoid bumper-to bumper traffic go during the week, not om the weekend. 3. Take advantage of local Visitors Bureaus to find the best place for what you want. . As an example, Door County in northeastern Wisconsin, and Traverse City in northern Michigan (below the Upper Peninsula) and Brown County (Bloomington and Nashville) in central Indiana keep tabs on what is available and know price points and type. The visitors centers’ websites also show where pets are welcome. Also stop at the Visitors Center for a map, brochures and suggestions because GPS will work some places but not all. 4. Because you are driving, not flying, throw those extra boots, hiking shoes, jackets, sun protector hats and sprays, water bottles, first-aid kits and backpacks into the car. Don’t be afraid to bring your own pillow for a good night’s sleep. 5. Don’t forget chargers for phones, ipads, cameras or whatever other electronics you take everywhere. Also check your accommodations before you leave, they already have enough chargers from previous visitors. 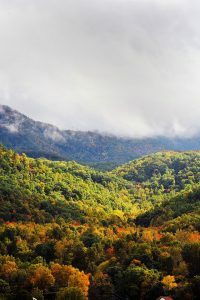 I love all parts of Tennessee but if you only have time for a color drive through one section you won’t go wrong choosing the Great Smoky Mountains National Park. BTW if you see bear cubs, pull to the side to take photos because “bear jams” instead of ordinary fall color “peeps” make it hard for people merely driving through the park from Nashville to get to Ashevill, NC. Put Sugarlands Visitors Center (above Gatlinburg) into your GPS to start the color drive. It’s a short drive south of Gatlinburg on US 441. At 5,048 feet you can stand with one foot in Tennessee and the other in North Carolina. The Tower is closed but the parking lot which also has great views is open. 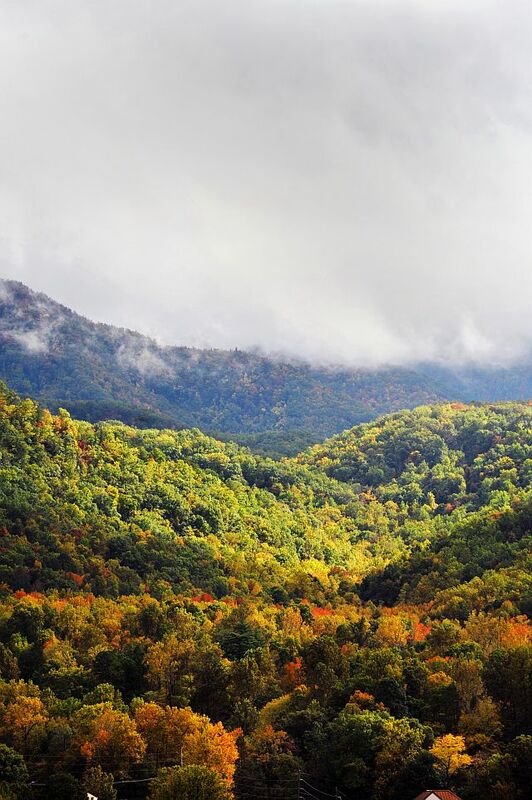 After going back down to Gatlinburg, drive the eight-mile Great Smoky Arts & Crafts Community loop on Glades and Buckhorn Roads. The art in the studios complement the park’s natural wonders. You are likely to return home with great photos and probably a well-turned bowl or gorgeous painting. For more information call (865) 436-1200 or visit the park headquarters at 107 Park Headquarters Road Gatlinburg, TN 37738. Now that leaves on a few trees are changing is the time to figure out where to go to see spectacular color in a few weeks and next month. Ephraim in the fall in Door County, WI. 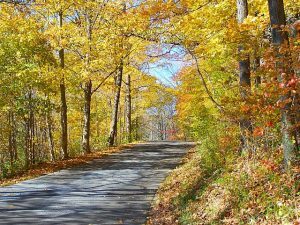 But if you don’t want to merely drive some place for fall color and then head back home then consider a vacation destination with great views, hiking, biking, fun shops and lots of lodging and dining choices. More information at Shawnee National Forest, Shawnee Wine Trail, Giant City State Park and Makanda. More information at Brown County State Park , Hoosier National Forest and Columbus. 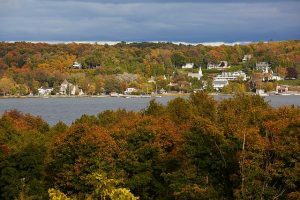 More information at Fall colors Wisconsin Dells, Baraboo, and fall color advantage. Traverse City area puts on a color show each fall. 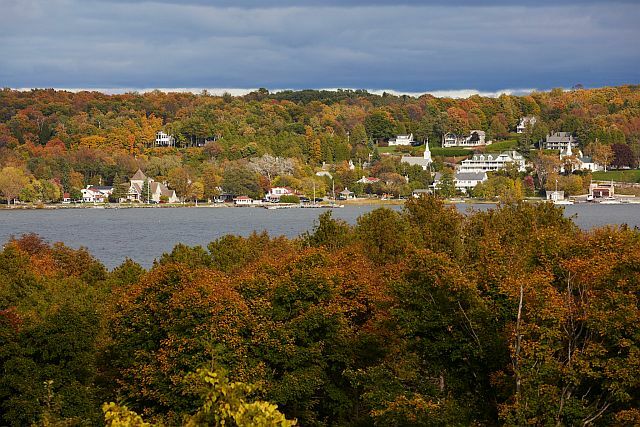 · Beautiful views of Lake Michigan and Traverse Bay. Fall color tips: For current Midwest color reports go directly to a state’s tourism site. Wisconsin’s suggested scenic drives are at Travel Wisconsin. Michigan is at Michigan.org and at Fall Color Tours. Minnesota is at MNUS and Explore Minnesota. Illinois is at Enjoy Illinois and ILUS. Have a fun, safe trip! Copyright © 2016 Travel Smart With Jodie. All Rights Reserved. Designed by Carlanne McCrystal, Expected Outcomes.